I am a great fan of Paramo and have championed them for many years. When the Velez Trousers came out I was delighted; the heavier Paramo Analogy trousers were simply too heavy for a multi week trek even in the cooler months. My XL Velez trousers weigh in at a very impressive 370 grams, I’ve used them on three TGO Challenges and have found that they remained comfortable even on hot days. They could almost be a perfect TGO Challenge piece of gear. The problem is the wear you can see above. This is my third pair of Velez trousers. Each pair have a similar wear pattern. Initially, I thought this was because I had caught them on a fence but some real thinking about it showed that this is often where my pack rests when I walk. 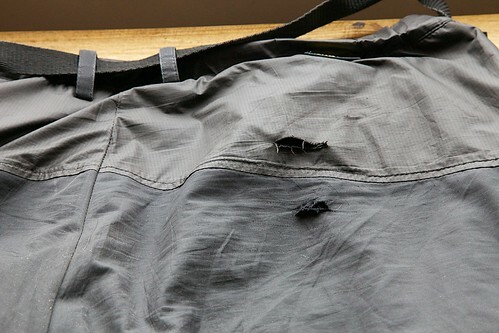 The lightweight outer fabric is simply not up to coping with this kind of wear. The lighter fabric also has another fault. In most rainy conditions these work perfectly but when you are in gales with rain been drive at you with force you can find rain can be driven through the fabric and the pump liner cannot then cope with the amount of water is dealing with. The result can be a very unpleasant, wet and cold experience though to be fair this has only happened to be me twice out of about 100 days of use (in total across all of the pairs). I still use these for winter day walks but in my experience these are not suitable for backpacking trips. This damage was recorded after 12 days of backpacking. I have similar photos of the other pairs damaged after similar periods. Sadly, the Velez becomes the third entry into the Hall of Shame. In the photo Cush Pillow is sitting to the right of its big brother. This is a real shame as the Cush is a great idea. It is a cheap inflatable pillow and cushion that can be daily folder over two or three times to alter thickness. It only takes 3 puffs of breath to inflate. On my recent Highland trip I found, on night one, that it had developed a slow puncture. It would appear that the valve is the villain of the piece. The last time that I had used it was as a seat to sit on while have breakfast at a Shropshire wild camp — taking care to make sure that it was not over inflated. The Cush had seemed fine when I deflated it and it was then stored with my down jacket and then at home stored in a safe gear box. The valve works slightly differently from most I have used. I hope this was just a dud. The valve on the mat has not given me any problems.